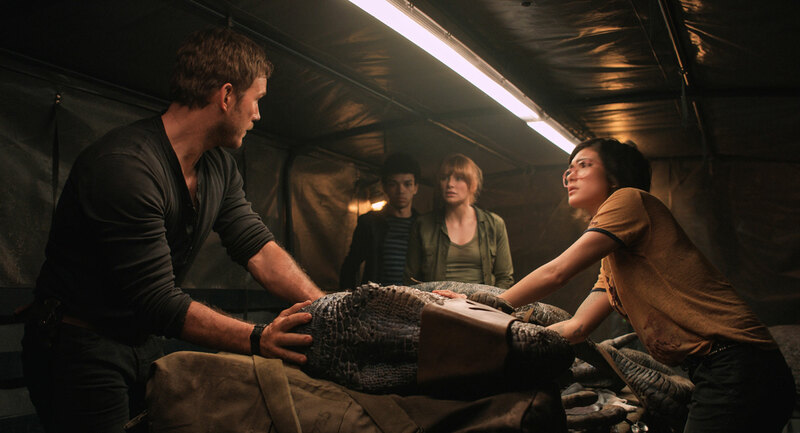 In Jurassic World: Fallen Kingdom, Chris Pratt and Bryce Dallas Howard is back as Owen and Claire, but they’ve split up and need to reconcile. They head back to the dinosaur island to rescue the doomed creatures from a volcano with a newly assembled surrogate family (but are they new? The nerds are awfully similar to Jake Johnson and Lauren Lapkus’ characters from the last movie). The villains in this movie is really remarkably evil. They’re on a mission to collect dinosaurs from the destroyed park of the previous movie for corporate financial reasons. But the more evil the villains, the more satisfying it is to see them eaten by dinosaurs or come to a spectacularly violent end. If you’ve seen the previous films in the series, the story probably sounds very familiar – specifically when compared to the franchise’s first sequel, The Lost World: Jurassic Park. But while the plot is very familiar, and might be accused of being a thin construction to tie action setpieces together, those setpieces are thrilling and tight, and constructed with a Spielbergian flair that confidently uses the camera more than visual effects to keep the thrills scary and viewers gasping. Director JA Bayona competently executes sequences that are delicately designed to stay narratively and visually interesting, but the underlying plot is flat, and character development is practically non-existent. I expect more from a massive Jurassic Park blockbuster than what Fallen Kingdom delivers, but the kick you’ll get from dinosaurs devouring bad guys is as thrilling as ever. If you expected a broadening of the cinematic world, or inventive franchise revitalisation, rather stay home and rewatch the first Jurassic World – or maybe even the first Jurassic Park. But if you’re mostly interested in computer-generated dinosaurs en Spielbergian sequences that might be lacking in Spielberg’s soul and spirit, Jurassic World: Fallen Kingdom will provide what you’re looking for. Jurassic World: Fallen Kingdom is in cinemas from 8 June.